Earlier this year, the Calder Foundation documented a series of pink and black sculptures, lithographs and textiles, all of which violate the artist’s intellectual property rights, often fraudulently misattributed to Alexander Calder. One of the misappropriated works documented by the Calder Foundation is a small metal sculpture that has sold at public auction over 75 times since 2004, at auction houses including Wright, Phillips, Drouot, Bloomsbury, Galerie Fischer, Van Ham. Since 2004, this work has been misattributed well over 40 times as a sculpture by Alexander Calder and more than 35 times as a sculpture created after Alexander Calder. 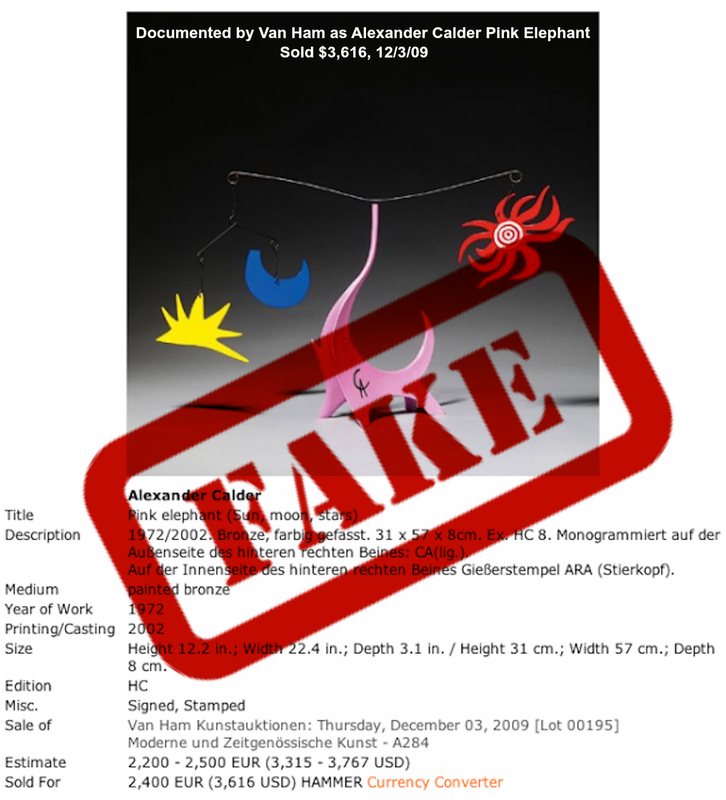 Thus far in 2013, counterfeit Alexander Calder sculptures have been sold more than seven times by auction houses online and off, including: artnet, Chantilly Encheres, Artprecium, LiveAuctioneers, Rome & Associates and Fraisse & Jabot. 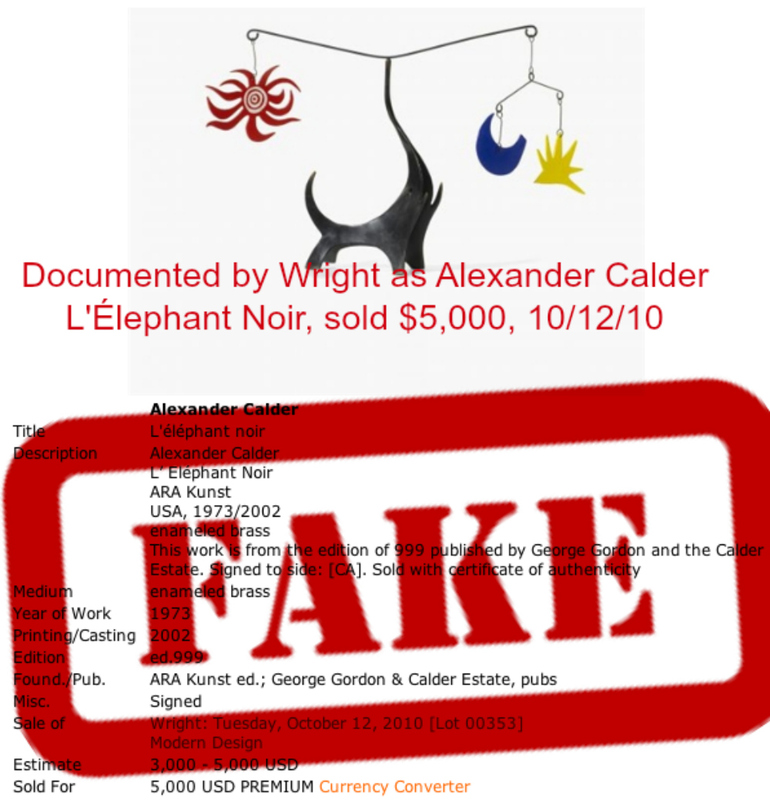 Thousands of dollars have been spent by innocent buyers due to deceptive selling practices; due dilligence by these firms would have revealed every one of the sculptures sold by these firms was not created by Alexander Calder nor ever authorized by the estate of Alexander Calder. This small sculpture not created by Alexander Calder once fetched $24,857 even though not conceived, designed, nor painted by Alexander Calder nor authorized by anyone from the Calder family or the estate of Alexander Calder. 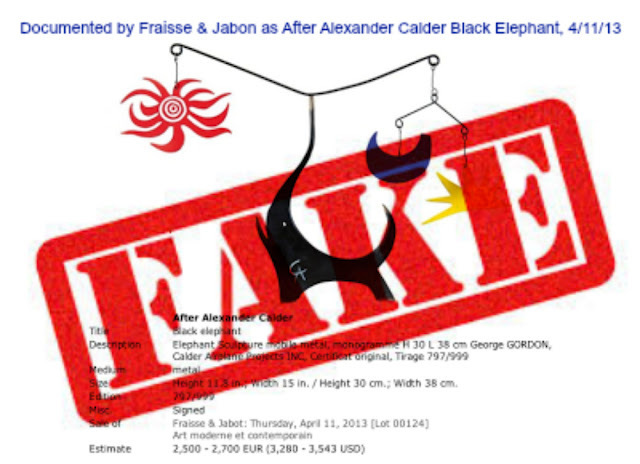 Google search any one of the erroneous titles and/or or images shown in this article, and you will see counterfeit sculptures attributed to Alexander Calder continue to be sold by unscrupulous art sellers. Many auction sellers further the deception by accompanying the misattributed Calder sculpture with a fraudulent “certificate of authenticity" also known as a "COA", allegedly written by George Gordon which also indicates that the sculpture was approved by the estate of the Alexander Calder which was never granted. The mobile elements were loosely based upon and have been misappropriated from images that Calder made related to his projects for Braniff Airlines. As Joseph K. Levene stated in Fine Art or eBay Fake Art? “certificate of authenticity”(COA) fraud is rampant. No matter how well written, a fake COA will always remain fake". The bottom-line is that no COA can transform a counterfeit work of art into an authentic work of art, and the fraudulent certificate by George Gordon is no different. 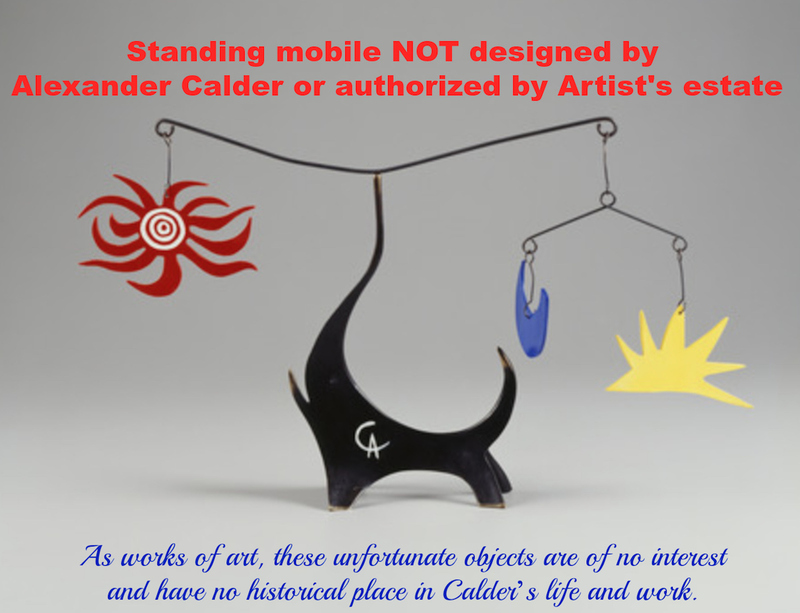 As the Calder Foundation states "As works of art, these unfortunate objects are of no interest and have no historical place in Calder's life and work". 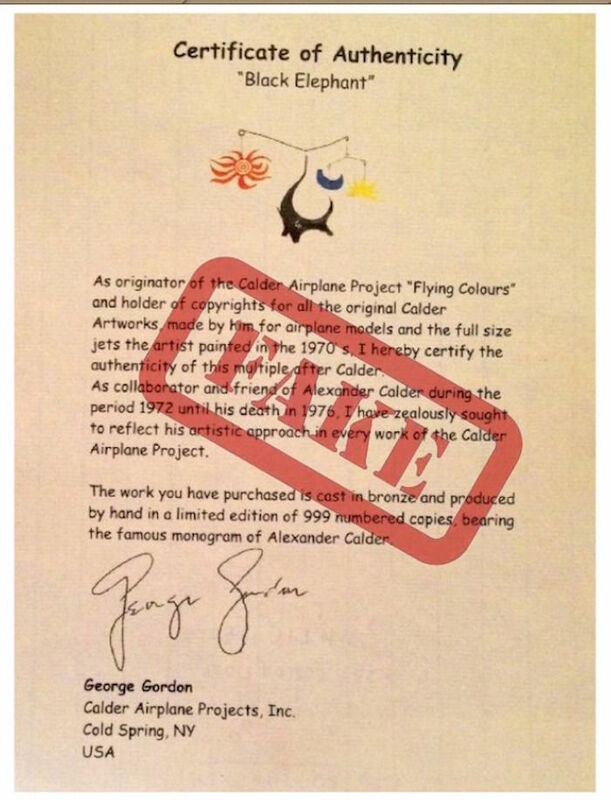 However, one thing you will never see on these fakes is a Calder Application Number which is necessary to demonstrate that a work by Calder is genuine. Curiously, many of the auction houses that have offered this small misattributed sculpture as well as the counterfeit textiles and lithographs also have sold authentic Calders that do have Calder application numbers. On May 1, 2013, a black elephant sculpture fetched $4,715 on artnet with a certificate of authenticity; estimated $4,000–$5,000, the counterfeit Calder attracted five bids. The monograph signature "CA" that appears on sculpture is a forgery. There is no authorized edition of 999. 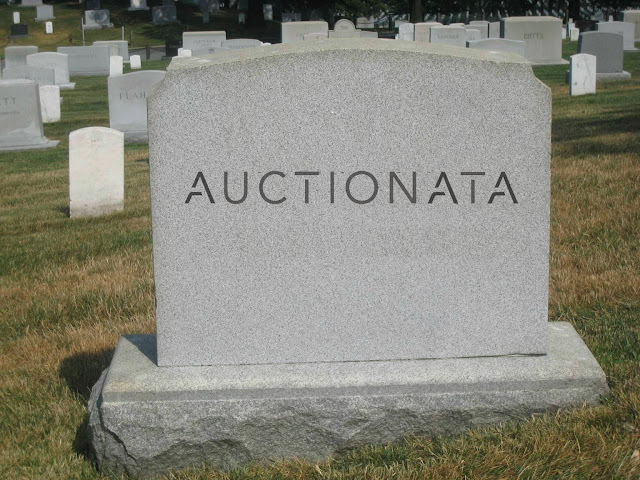 Many purported sculptures sold repeatedly, each with same edition number. The certificate of authenticity (COA) from George Gordon is counterfeit, pure fiction! Sometimes documented with 1973-2002 date, which is impossible since Alexander Calder passed away in 1976. Other times, erroneously documented as sculpture created in 1972 or 1973. Everything about this misattributed sculpture allegedgly created in an edition of 999 is fiction, or to put it in art terms, a blatant counterfeit, yet numerous galleries, brick and mortar auction houses and online auctions continue to sell it. If you purchased one of these pink or black elephant forgeries, and thought it was an authentic Alexander Calder sculpture, here's the bad news; this purported work is counterfeit, not created by Alexander Calder or authorized by the Calder estate, and will never have any value or considered as a collectible work of art. To sum it up in one word, it is "fake".